But dogs and cats don't brush their teeth. It should therefore not be surprising that they frequently develop dental problems. It's just like your mother used to tell you when you were little: "If you don't brush your teeth, they'll all fall out!" In order to better understand dental disease, lets start with a brief review of the pertinent anatomy. I will use drawings from human dental texts because they are easier for us to relate to. The tooth shapes are different in dogs and cats, but all the parts are the same. Enamel is the hardest biologic substance known. Harder than even bone, it forms a durable outer layer on each tooth. Underneath the enamel is a layer of a somewhat softer hard material called dentin. 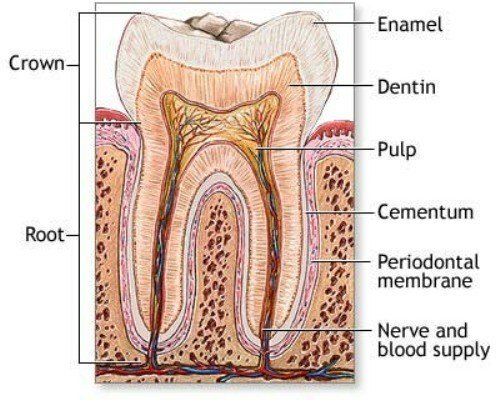 Inside the center of the tooth is the pulp, which is composed of blood vessels and nerves. A tooth is alive, and it is the pulp that keeps it alive by providing blood, oxygen, and nutrition to the living tissues of the tooth. The tooth sits in a socket in the bone of the jaw. It is held in place by its roots. The dentin of the roots is covered with a layer called cementum, which helps cement the tooth in place. The periodontal membrane, or periodontal ligament as it is more properly called, is a ligament just like any other ligament in the body. The periodontal ligament is made out of tough connective tissue, and runs between the bone of the jaw and the cementum of the roots, and holds the two together in a strong, flexible, elastic bond. The gums, or gingiva, cover the bone of the jaw and attatch to the cementum of the roots leaving a small pocket, or gingival sulcus, normally less than 2mm deep in dogs, between the enamel of the crown and the gingiva. Bacteria on the surface of a tooth normally form what is called plaque. Plaque is a biofilm, a thin, translucent film made up of bacteria, proteins they secrete, and food particles. Normally, plaque is removed soon after it forms by the simple act of chewing. Dog and cat teeth are arranged differently than human teeth in that most of them do not touch together. That means that chewing is more likely to be an effective way to remove plaque than in people. Not surprisingly, we see the most problems in places where the teeth do touch together: the incisors in front and between the big molars in back, and in toy dogs where all the teeth are jammed tightly in to a small mouth. If plaque is not removed, the bacteria that form it continue to multiply. The plaque gets thicker, and the nature of the bacteria that make it changes to a more sinister character. The thick persistant plaque will mineralize, forming tartar. Tartar, although it looks like it might be mineral deposits, but it is actually about 80% bacteria. And unlike plaque, tartar is firmly adherent to the tooth, and neither brushing nor chewing is effective in removing it. This is especially true when tartar builds up under the gums. In dogs and cats, cavities are not a real problem. This type of decay seldom happens in pets' mouths. However, the bacteria in tartar make toxins and harmful waste products that can damage the gums and other soft tissues. The inflammation that results from tartar's interaction with the soft tissues releases other damaging compounds. In the images to the left, we see brown tartar building up both above and below the gum line, and the tissues are becoming red and swollen because of the inflammation. As the infection progresses, the gums and soft tissues are eaten away by the bacteria. This is called Periodontal Disease. The gingival sulcus becomes abnormally deep, and is now called a periodontal pocket. The difference between a gingival sulcus and a periodontal pocket is that in a gingival sulcus (normal), the root is not exposed. 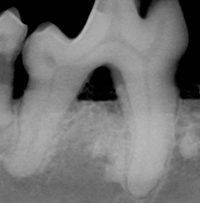 In a periodontal pocket (abnormal), the root is exposed. As the periodontal pocket deepens, soon even the bone itself begins to be resorbed. Then the infection invades the periodontal ligament and destroys it,and the tooth becomes loose. The progression of periodontal disease is divided into stages. Although the stages are somewhat artificial, it is nonetheless very useful to classify it this way. Plaque is present, but tartar is minimal. 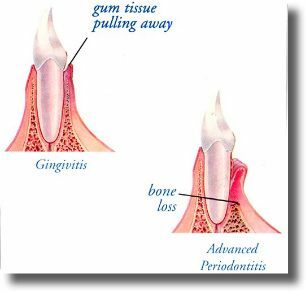 The gums are mildly inflammed, as evidenced by a slight reddening of the margin, and they are swollen. There is no soft tissue loss, no abnormally-deep pockets, and no bone loss. The damage done at stage one is reversible, meaning we can make it return to the original, undiseased state with treatment. Stage Two: Early Periodontal Disease. Here there is more advanced tartar build-up with the accompanying inflammation, but there is beginning to be soft tissue loss, gum recession, abnormally-deep periodontal pocket formation. There will be early bone loss too, but less than 25%. The teeth are not loose at this point. 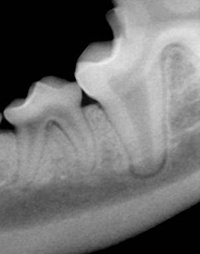 To the right is an image of a dog's molar with stage two periodontal disease, and an x-ray of the same tooth. Notice the bone loss lurking under the gums! The damage that happens in stage stage 2 periodontal disease in not reversible! Although we can often achieve soft tissue regeneration, bone loss is especially hard to deal with, and we may not ever be able to get the bone to regenerate. The deep periodontal pockets that form pose a particular problem in that they are "tartar traps." Plaque will form in the pockets, and it can be difficult to remove it by chewing or brushing, and this makes it difficult to stop the progression of the disease. Here there is severe tartar build-up, advanced soft tissue loss, deep periodontal pockets, and considerable bone loss somewhere between 25% and 50%. The teeth, especially the single-rooted teeth, begin to be noticably loose. Under these ravaged gums significant bone loss has occurred. Note particularly the "hole" that has appeared between the roots of this tooth. Once this occurs, it is often best to remove the tooth because plaque and tartar will build up in that hole almost immediately after it is cleaned. This is as bad as periodontal disease gets. The tooth has lost over 50% of it's bony support, and is very loose. The infection has eaten the jaw away from the tooth. Nothing can save this tooth, and the patient will be much better off without it. It is loose, wobbly, and stinky. These teeth leak bacteria and toxins into the patient's system 24/7, and they must be removed. It is important to remember that any one individual can have some teeth that are perfectly normal, some teeth that are Grade One, some teeth that are Grade Two, some teeth that are Grade Three, and some teeth that are Grade Four, all in the same mouth. It is also important to remember that we can not grade a given tooth accurately unless we both probe and x-ray it. This means that when we examine a patient awake, we are only guessing at what dental problems may be there. I hope you have enjoyed this discussion of dental disease. Click here for a discussion on when to have your pet's teeth cleaned, and click here to go to an article on how to brush your pet's teeth. Does my dog or cat need to have his teeth cleaned? If the question is will your dog or cat die immediately if his teeth are not cleaned, the answer is no. If the question is will your dog or cat be healthier and happier if his teeth are cleaned, the answer is yes. In modern society, oral hygiene is pretty much expected for civilized people. Not only has science proven that there are huge health benefits to having clean teeth, it is generally accepted that not brushing in not cool. To prove the point, we have redneck jokes about lying through your tooth, a whole mega-billion dollar industry based on fighting bad breath, and yeah, baby, Austin Powers. And this is a good thing. Periodontal disease has a number of serious complications. Arguably, better oral hygiene is responsible for a large part of the increase in human lifespan we have seen in the last century. While it does not take rocket science to determine that the dog in the image to the left has big oral health problems, at what stage of dental disease should we start treating your dog or cat? How bad is bad enough? In the past, we have been more tolerant of bad teeth in our pets. Many veterinarians will wait until there is massive tartar build-up, along with severe periodontal disease, bone loss, and tooth damage, before they would recommend cleaning. Would your dentist say, "well, Bob, you are developing periodontal disease which will make your breath smell like a sewer, damage your gums, and eat away the bone that supports your teeth till they get loose and wobbly. But why don't we wait till next year when things have gotten a little worse to start treatment?" Or would your dentist ever say, "well, Jane, your severe periodontal disease is showering your body with bacteria and toxins 24/7 causing kidney and heart disease, but after all, you are pretty old and it may not be worth treating you, if you know what I mean." I don't think your dentist would say that! Infected teeth, or periodontal disease, start out as mild plaque build-up with mild inflammation of the gums, but no deeper involvement and no loss of the supporting bone. There may not even be much visible tartar build-up at this stage, and the teeth may appear quite white and normal. However, there will be a red line at the margin where the gum meets the tooth. This red is the same red we see when a cut or scratch gets infected, and is called inflammation. The red tissues may bleed easily when touched. There may be a bad odor, and translucent plaque may be visible. This is called Stage I Periodontal disease. As periodontal disease advances, the infection works it's way down deeper along the tooth roots. Stage II Periodontal Disease involves loss of up to 25% of the boney support of a tooth. This is where we start to find deep pockets in the gums around teeth when probed with a dental probe. There is often visible brownish tartar, and the odor is stronger. The teeth are not yet loose. There are more stages of periodontal disease, but I'm going to stop here. Why? Because for our purposes, only the first two matter. This is because only Stage I Periodontal Disease is truly reversible. That means that once your pet reaches Stage II, damage has taken place that can never be repaired. If you wait until the disease has advanced to Stage II or beyond, there will be permanent gum damage and permanent bone loss. Once teeth become loose they do not ever "tighten up" again. And once pockets have formed, they serve as "plaque traps," making it very difficult to keep clean teeth from getting re-infected. Our goal is to treat Stage I Periodontal disease before irreversible damage happens. A professional cleaning, followed by some preventative measures, can go a long ways to helping your pet have a healthy and happy mouth. So don't be surprised when we recommend dental work for your pet even if you can't see terrible disease. At Sunnyside Veterinary Clinic, our goal is to maximize your pet's health and well-being. Early intervention, combined with proper preventative measures, can greatly improve the quality of your pet's life. I hope you have enjoyed this article on cleaning teeth. It is very important to focus on the "root" of the problems. That's a little dental humor. But seriously, a good dental cleaning starts under the gums. It doesn't matter how clean and shiny the crowns of the teeth are if there is still disease and infection left under the gums. There will still be infected teeth leaking toxins and bacteria in the system 24/7. A very common finding, broken teeth are a very painful and often untreated problem for many dogs. Here's some help in understanding what the problem is and what to do about it. Lots of dogs have broken teeth. Often, the owners had no idea the tooth was broken, and the dog seemed fine. Sometimes the owners knew it was broken, but it had been broken for years and didn't seem to bother their dog any. We know that if it was our tooth, it would be painful, but many dogs with broken teeth do not seem to show any signs at all of pain. Science tells us that our dog's teeth and nervous system are identical to ours. The teeth are put together in the same way, with a layer of ultra-hard enamel over a layer of softer dentin , all surrounding the pulp chamber which is full of nerves. If you have ever had the experience of having the dentist drill your tooth before the anesthetic took full effect, you will immediately appreciate the fact that teeth are a living bodypart with a very sensitive nerve supply. Broken Teeth also are prone to infection. The pulp chamber is opened, and this allows bacteria to enter the tooth, causing an abscess. In the image at the top of this page, an abscess (the dark spot) can be seen draining out of the gum above the tooth. To sum up, short-tern, a newly-broken tooth is very painful. Long-term, the pain decreases to a dull ache. And many broken teeth become abscessed. None of these situations are good, so we recommend that all broken teeth be removed. So why don't many dogs show signs of pain? The answer is complex. Click here for an article on Pets in Pain, which gives the long answer. The short answer is that nature has taught animals to hide their pain rather than show it. The signs of pain that they do show are often subtle, and are often not noticed by owners until after the source of pain is removed. If your pet has a broken tooth, the best thing to do is have it removed. Your pet will feel better, and a source of chronic infection will be removed. Root Canal therapy is the only other option. Cats get an unusual dental disease. It's not cavities. It's not periodontal disease. It is a condition which happens very rarely to dogs or people, but which is quite common in cats. We're talking about Resorptive Lesions (but we'll call them RL's for short from now on). They used to be called FORL's, which is short for Feline Odontoclastic Resorptive Lesion. The veterinary dental guru's now just call them Resorptive Lesions, or RL's, because as our understanding of them progressed, we found that the odontoclasts weren't such a big part of it after all. I guess the key point here is that while we as veterinary dentists are very familiar with what Resorptive Lesions look like, we really are just in the investigative stages as far as understanding what causes them. What is an RL? An RL is a hole in the tooth. While there are some important differences between RL's in cats and the cavities we have all had, there are many similarities. A cavity is a hole in the tooth.No Description In the picture of a human tooth below, the cavity is the brown spot visible at 9:00. Cavities are caused by decay. Bacteria in the mouth feed off sugars, and ferment them to make acids, which eat away the protective enamel. Once the cavity gets through the hard enemel, it begins to attack the softer, sensitive dentin underneath. It is at this point that the tooth becomes painful. As the cavity progresses, it erodes through the dentin into the pulp of the tooth. 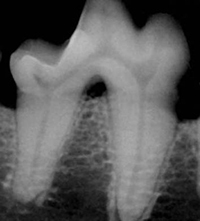 The exposed pulp then become infected, and abcessNo Description resized to 300 pixels widees form at the tooth roots.The x-ray to the right is of a cavity in a human tooth. The cavity istelf is the dark "hole" seen in the right half of the tooth. Cavities are caused by bacteria and happen from the outside in. RL's are caused by some as-yet undetermined process, likely involving either the cat's own immune system or a defect in vitamin D metabolism, or maybe both, and happen from the inside out. But the net effect is the same. In the picture below, we see the teeth in the bottom jaw of a cat. Notice how red and inflammed the gums are. The redness is worse around the tooth on the right. An x-ray of these same teeth is posted beside the photograph. Like the cavity, the RL is seen as a darker spot in the tooth. In this case, the RL is located on the left root of the righthand-most tooth. Notice the similarity to the cavity in the human tooth shown above. Like cavities, once there is a hole leading from the sensitive dentin to the outside, the tooth becomes very painful. How painful is it? The answer is very painful. Most cats with RL's will exhibit teeth-chattering when the RL's are touched even lightly with even a Q-tip. Basically, the tooth is so painful that merely touching it with a soft object will send the cat into jaw spasms of pain. Your cat may not show many other signs of pain, however. This does not mean that the cat does not feel pain. Click Here for a more detailed discussion about how to tell if your cat is in pain. The Treatment of Choice for RL's is Extraction. It does no good to put a filling in an RL. The erosive process that caused them in the first place will dissolve the tooth out from around the filling, and the filling will simply fall out. While it may seem a bit extreme to extract a tooth with an RL, just consider the alternative: Living daily with a very painful tooth. There are things to know about extracting teeth with RL's. Look again at the radiograph of the cat tooth with an RL. This time observe the roots closely. You wil note that the smallest tooth has roots that seem No Descriptionblurry or indistinct when compared to the roots of the neighboring teeth. This is because the roots are starting to be resorbed too. The tooth as a whole is undergoing a disease process, and not only is there a hole eaten away from the crown, the roots are becoming weak and brittle. If weak and brittle weren't enough, the roots also become cemented into the jaw bone. This means that teeth with RL's can be very difficult to extract. The roots tend to shatter and fragment, making it difficult to get the whole root. It is in general a bad idea to leave root fragments in place because they are often infected, and retained root tips can continue to No Description resized to 300 pixels widebe painful. The radiograph at the left shows another cat with two retained root tips. One is easily visible, and the second is barely visible just to the left of the obvious one. There is a fairly obvious dark halo around the root tip we can easily see. 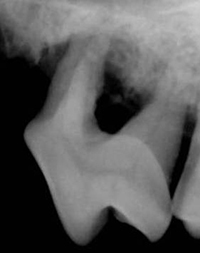 This halo is caused by infection in the retained root tip. Infection trapped deep in this buried root tip is eating away the bone at the tip of the retained root, causing the dark halo. It takes a lot delicate work using the proper techniques and the right instruments to safely and completely remove RL teeth. RL teeth must be removed surgically. In a surgical extraction, the gums are cut, moved out of the way, the tooth is cut carefully into pieces, some of the overlying bone is removed, and the tooth is gently removed. Then you MUST take post-extraction x-rays to be sure you got all the root tips. Then the gums are sewn back into place. Because this can be a very lengthy, delicate procedure, treating your cat's RL's can be fairly expensive. Most cats develop RL's in more than one tooth. It is quite common to have to extract many teeth at a time. Sometimes all the teeth must be reomoved. However, once the healing process is over, the cats are much happier without all those painful teeth. RL's are a common and very painful dental condition in cats. Many cats suffer years in silence with very painful teeth. Treating RL's is not simple, but your cat will definitely thank you for the relief! Puppies are a lot like babies. They are both cute, they both whine a lot, and they both have a set of baby teeth which are later shed so a new set of permanent teeth can grow in their place. We call the baby teeth "deciduous" teeth, because they are shed like the leaves on a deciduous tree. Most of the time this process proceeds without hitch. However, occasionally, some of the deciduous teeth will be retained, or not shed, and this can cause problems. Almost exclusively this happens to the large canine teeth. Sometimes both top baby canines will be retained. Sometimes all four are retained. It is most likely to happen in the small breeds: Chihuahua, Yorkshire Terries, Poodle, Lhasa Apso, Bichon Frise, etc. In the image to the right, the thin, sharp deciduous canine tooth can be seen behind the larger, rounder adult canine tooth. The retained teeth can cause problems in two ways. One is that the retained tooth interferes with the proper eruption of the adult teeth. The adult teeth can erupt too medially and hit on the sensitive soft tissues of the hard palate, causing sores or fistulas. More commonly, the retained baby teeth trap food and debris, and promote plaque and tartar formation, leading to periodontal disease which can destroy both the baby tooth and the adult tooth. In the previous image, the sharp eye can see a brown discoloration between the two teeth. This is tartar and periodontal disease. The retained teeth are supposed to be shed at six months. I generally wait a few months longer to see if they won't come out on their own. After that, they need to be extracted. These teeth, although they look small, can be very difficult to extract. They often have very long, thin roots which can fracture easily. It is bad to leave a broken root tip. The retained teeth are also very close to the new adult teeth. At this early stage of their development, the adult teeth have very thin walls and are quite delicate. They can easily be punctured by the extraction instruments and permanently damaged. Extracting deciduous teeth requires general anesthesia. It is a good idea to plan the extractions to be done at the same time as your puppy's spay or neuter surgery.